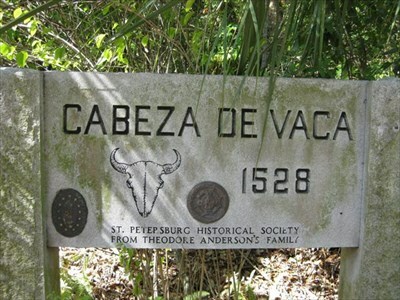 Tocobaga Indians, Spanish explorers, pirates, fisherman, developers, gangsters, and peacocks – The Jungle Prada Site has more than 1,000 years of history! This quiet corner of St. Petersburg was the location of an American Indian village for over 600 years. 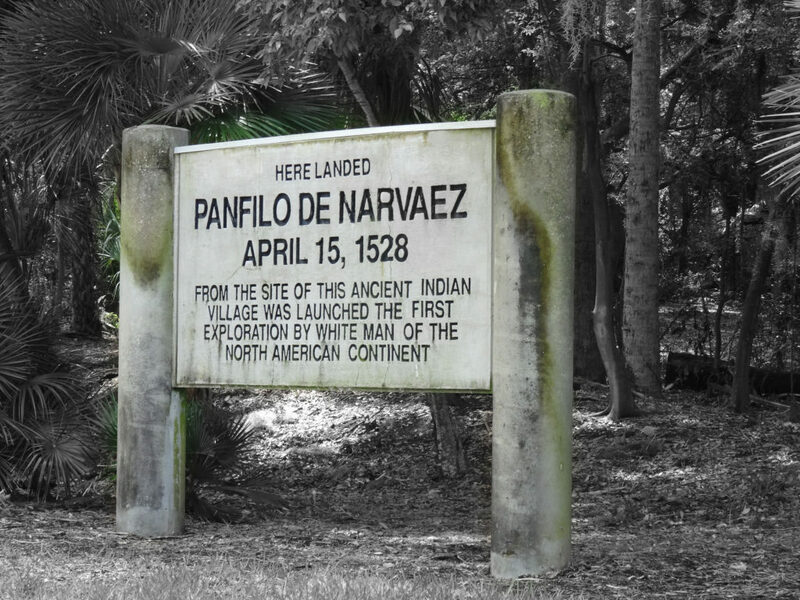 A concrete marker placed along the road in 1933 reads: Here landed Panfilo de Narvaez – April 15, 1528 – From the site of this ancient Indian village was launched the first exploration by white man of the North American continent. This was the center of a Tocobaga Indian village where people lived and worked for hundreds of years before the arrival of the Spanish. 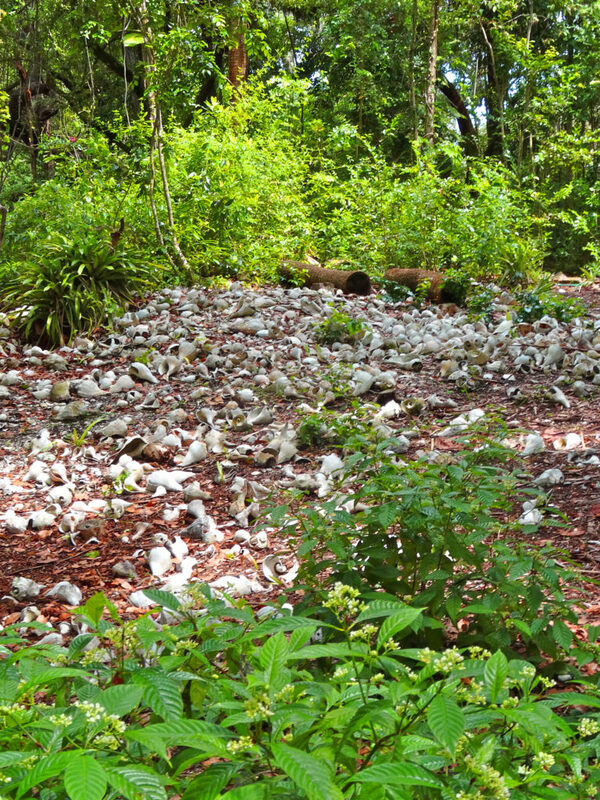 The shell midden mound on the Anderson property at Jungle Prada is the best-preserved example of an American Indian mound in the Tampa Bay area! The horse conch and lightning whelk shells that cover the ground here are between 500 and 1,000 years-old. They are the original building material used to raise up the village. Harold C. Anderson was born in 1905, and moved with his father from upstate New York to Florida as a small boy. Growing up in St. Petersburg during the 1920s, he was always fascinated by a region on the outskirts of town that was covered by huge live oaks and giant snaking vines. The locals called this area “The Jungle”. Deep in the jungle there were some mysterious mounds on land owned by a local developer, Mr. Walter P. Fuller. Mr. Anderson realized that these were the remains of an American Indian village! A series of economic depressions caused Fuller to list the much of his land for sale in 1940, and Mr. Anderson was able to purchase most of the village plaza and shell midden for a price of $20,000. Mr. Anderson called himself the caretaker of the land. He often said that the mounds belonged to everyone, but that it was his duty to preserve them. Mr. Anderson built his home at the site without cutting down any trees. Through the years, as the surrounding area was developed and redeveloped, Mr. Anderson kept his part of the shell midden in what archaeologists call “pristine” condition. 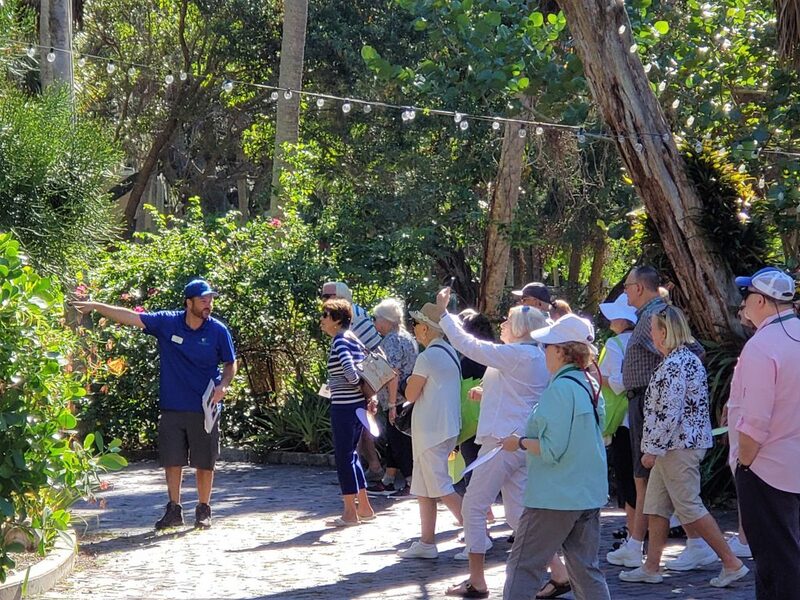 Today you can tour the ancient mound and learn about the lives of the Tocobaga Indians who lived at the site all those years ago. David Anderson, Harold Anderson’s grandson, leads our guided tour. It’s a 75-minute long journey through the past in a timeless setting overlooking beautiful Boca Ciega Bay. David is a horticulture professional like his grandmother Frances Anderson was before him. Did we mention that over 50 free-roaming peacocks live on the property today? These colorful birds have been here since the first two wandered over in 1953. A small museum in a converted greenhouse on the property features artifact found during a professional archaeological dig which took place from 1994 – 98. 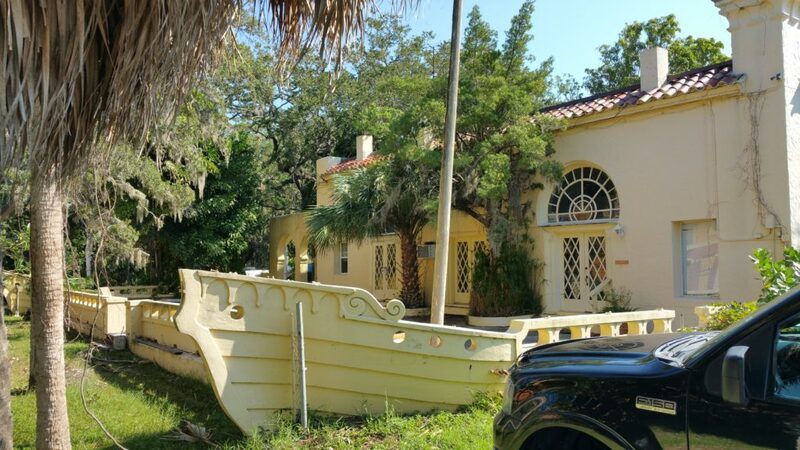 Come discover this hidden family-owned gem in St. Petersburg! Tours are Wednesday through Sunday at 11:30 and 2:30. Free parking available at Jungle Prada de Narvaez Park. 1700 Park St. North, St. Petersburg, FL 33710.